The exterior is a little rough around the edges but don’t let that fool you. 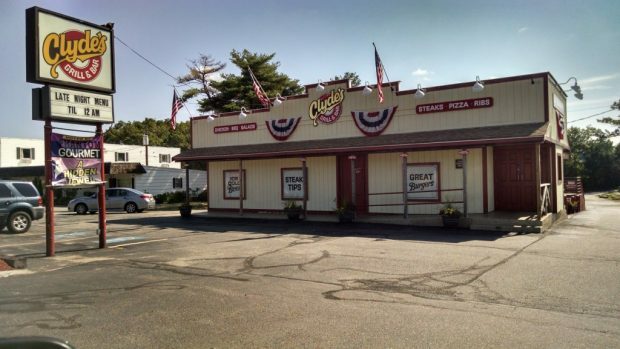 Clyde’s is a great place to take the kids for some good food and a laid back atmosphere. The tables are covered in paper which the little ones are encouraged to draw all over. The waiter/waitress comes over and writes their name with a crayon on the table for you. My daughter thinks this is so cool. They have a deck of cards at the table to keep you entertained while you wait for your food as well. The food is pretty decent and they have great kids’ meals. The kids’ meals even come with a free dessert at the end which we save for the car (usually a packet of Oreos.) This is perfect for bribing the kids to leave fast, get in the car and buckle up so they can have their treat.